Discussion in 'Plant Pests, Diseases and Weeds' started by Tina, Jul 10, 2011. Please help my Hollyhock plant. I love this one - it is a perennial and comes back every year with beautiful blooms.Something seems to be eating it now. It has so many buds but the leaves and stem are eaten. I removed most of the leaves today - but dont know if that is enough. Please please help me save it. Texas people,, need help IDing this weed ! I'm not positive, but they look like Spider Mites to me. When I have them, a good spraying with Dawn dish soap and water typically gets rid of them. Just make sure you spray when there's no chance of the sun hitting the plants... it will burn the leaves. Perhaps someone else will come along and give you a definitive answer. They also look like Spider Mites to me,..not easy to get rid of them,..but i agree with Cheryl that spraying with the Dawn Dish Soap does get rid of them,..another concoction is as below. Mix all together well and spray on plants. If all that fails then there is the old plastic bag trick,..seal the plant within a plastic bag,..the moisture will be drank by the mites until they swell up and die,..it does work as a last resort. I will try the Dawn Dish soap trick first. After the blooms - I hope they do flower this year - are gone, will make those darn mites drink, swell and die!! It looks like you have a couple of problems there. (3) The smaller holes in that one leaf look a bit like earwig damage to me, although there is a range of things that it could be such as small slugs, leaf hoppers, immature grasshoppers, etc. (4)That gaping hole in the stem makes me wonder about about a small rodent like a shrew or mouse. Having said that, it is possible that a slug could cause this. If mice or shrews frequently climb up your Alceas stalks they would leave urine stanes on the stalks. You would recognize these bas being long, brown places--where the urine has run down the stalk. It is not usual for mice and shrews to begin crawling up your stalks quite this early in the season (usually they wait until some of the seed pods have turned brown), but I have seen them in my garden and wondered if they were checking out the green seed pods to see if any were ready for nibbling. 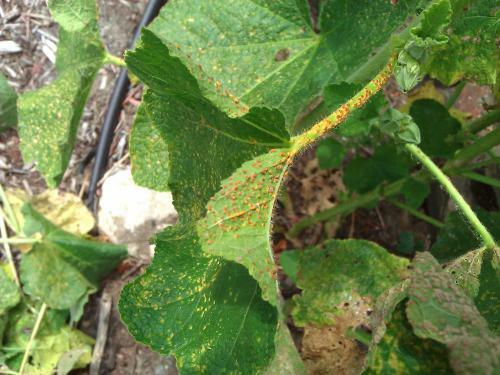 You cannot do much about the rust at this late date except to remove infected leaves, clean them up from the ground and to destroy the leaves and stalks after the season. It would be best to burn them. I layer of compost mulch in the spring would help prevent infections anew. There are anti-fungal sprays that one can employ onto new growth PRIOR to the time of season when the rust is due to occur. There are any number of techniques to combat slugs. When a plant that is very special to me is being attacked, I use a few slug pellets in a glass jar, placed under the plant. 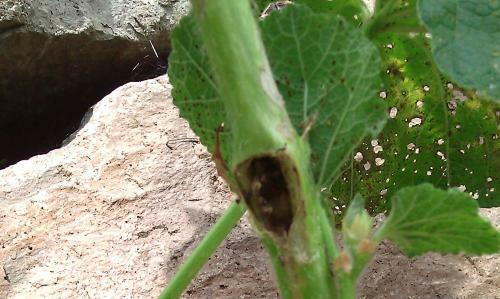 As for chewing insects and larvae, about the only thing that you can do to combat these is to inspect your plant frequently and hand remove them. All of this said, I have a feeling that if you just accept the invasions of these various garden thugs, and would do nothing...I believe that your plant would return next year like new. I have the problems on my hollyhocks that you do here and after years of fighting these beasts, I now just leave them and remove the rusty leaves and pluck off the slugs and beetles when I see them, and my plants just keep coming back each year. I also have a little black weevil that attacks the stems of my hollyhocks and every perforation places results in a black spot. The stems are riddled with them. I sit and pick off the little devils as I drink tea. They are too numerous of successfully combat them without using pesticides, and I do not want to do that. I have to say that I am not seeing the damage that would make me think of red spider mite...but that could just be MY eyes. 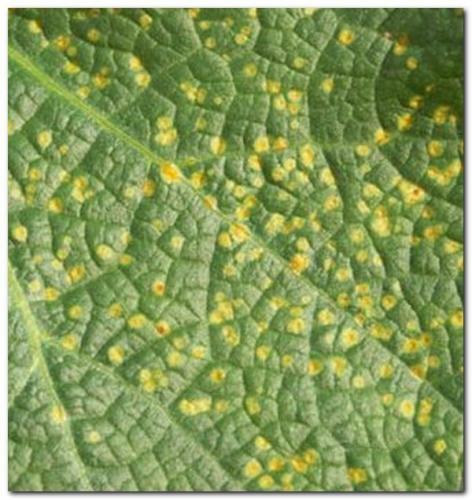 I agree with Sjoerd, I don't think that it is spider mites, but you wont hurt the plant to treat it for them, Spider mites make the leaf look as if it has a more even pattern of fading. the orange looks like a fungal infestation of some kind. remove the leaves and dispose of them in the trash and wash your hands before going on to the next plant, you don't want to spread that to another plant by mistake. All those little holes in the photo by the stem with the hole reminds me of flea beetle damage. The hole? no clue what would like to eat your plant like that. It could have been a smaller wound and enlarged by another insect. to be certain just what you have,..get a hand lens and look at those leaves,..if you see what is in the picture below then its "Hollyhock Rust". On the other hand examine the leaf for Mites,..you would find it difficult to see them with the naked eye,..they are soooo small,..and do not move about much,..they just remain sucking out the plants juices,..and will puncture the leaves to get at plant juices,..the eggs laid are even smaller and appear like small pearls,..i have examined your picture and zoomed it up to times X500,..the dots you see are raised and not flat,..but i still can not see clearly,..however if you have a hand lens and you see whats in the picture below,..then its "Red Mites". The recipe i gave earlier will work,..as will a strong spray of water,..but only for a limited time,..what usually happens is that "Predatory Mites" come along and eat the "Red Mites" to a well balanced level,..you can actually purchase these "Predatory Mites",..though i believe they are expensive. 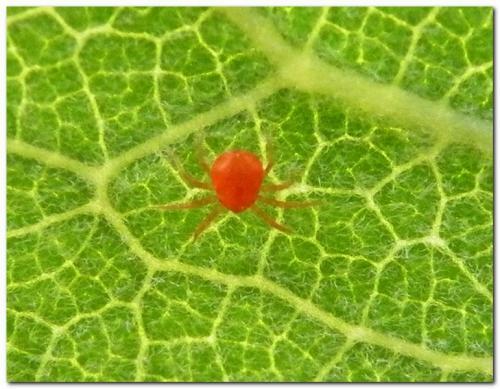 There are a great many other recipes to eliminate "Red Mites",.."Red Two Spot Mites",.."Brown Mites",.."Yellow Mites",..and "Green Common Mites",..i would try anything to suit my pocket,..and any bit of advise is an added bonus. For further reading on these Mites check the link below. Tiny black dots on my Swiss chard? Can this Crepe Myrtle be saved?